JayJay here, again. I’ve been sending Jim little comments and questions that I’ve read on various forums and on Twitter and he has agreed to respond to some of those as well as some of the blog comments. There was, indeed. It was one of the short LSH stories that appeared in Action Comics. It wasn’t taken straight from my life, but let’s say it was “flavored” a little by my experiences, including my senior prom. Keith, I assure you that I did not exaggerate at all with regard to Mort’s treatment of me. I did not/do not “feel” that I was treated that way, I was treated that way. Regarding how I treated my “work force,” what are you saying? What did I do? How, exactly, did I mistreat anybody? Please give me a for instance or three. I wasn’t at the alleged meeting in question, but I was in several smaller-scale discussions at DC that echoed the sentiments allegedly expressed at said meeting. DC editors thought Marvel’s art, especially Kirby, Ditko and Ayers’, was “crude” and child-like. Mort mused that maybe kids related to it because it was like their own scribbles in their school notebooks. I never actually heard anyone tell an artist “draw worse,” but that was the implication. The DC editorial types also thought that Marvel’s coloring was “garish.” For a few months, in Mort’s Superman Family titles, they actually ran color IN THE GUTTERS to make the books more garish, like Marvel’s. Then, they decided that, since some Marvel artists did odd-shaped, non-rectilinear panels, that maybe that was the way to go, so they tried that for a few months. Other idiotic stuff, too. I remember one meeting when Mort was looking through some Marvel comics. There were other people in the room. They were ridiculing the books. There was a issue of X-Men with a full page or at least a large panel of the Angel soliloquizing about the joy and glory of flying. They couldn’t believe that a page was wasted like that! Someone said, “Superman flies all the time. It’s no big deal.” Exactly. They also were amused by a two-page conversation between Peter Parker and Aunt May. Someone said, “Two pages talking to his Aunt! The kids (!) will be bored to tears.” Nope. And we weren’t all little kids. Mort figured that except for weirdos, age eight was about when “kids” stopped reading comics. As I have said here and elsewhere, Kirby wasn’t coveted by DC in the mid-to-late ’60’s. They thought of him as third string, and simply could not understand why Marvel was on the rise. No one would have been angry at Schiff for “letting Kirby get away,” in my opinion. Whether he was blacklisted or not, I don’t know, but I doubt it. Also — by the way — DC editors each had their own little fiefdoms, and if Jack Schiff had a grudge against Kirby, I guarantee you that it would not have prevented Kanigher, Schwartz, Mort or anybody else from using him, if they wanted. No artwork on Secret Wars was ever changed due to some issue with Kitty Pride. Of that I’m sure. Don’t know what you’re talking about. Maybe Chris remembers better than I do about KP’s absence. Was she absent? If you say so. Dunno. Did you attend an “art school” in addition to Carnegie Mellon, or are you referring to classes you took at Carnegie Mellon? Did you take art classes while still in high school, and/or in the summer between graduation and your brief stay at Marvel? The only art classes I took were at Carnegie-Mellon. It was a special program for high schoolers for which you had to be selected, and very few were — only 50 each year, I believe, from the entire tri-state area around Pittsburgh. The classes took place on Saturdays during the school year. They were taught by C-M professors. Classes started in the early morning and went till mid-afternoon — something like six hours, as I recall, with a half hour break around noon. The first year, everyone had to take design. The second through fourth years, you had a choice — I took two years of drawing and one year of painting. The other option was sculpture. Those teachers were incredible. The classes were amazing. I learned a lot. I loved it. “Decompressed?” Is that what they call it? Wow. I don’t like it. When I was a kid reading Spider-Man, when I got done with an issue, I felt like I’d seen a movie — so much had happened, so much I cared about. These days, it seems like it takes only a minute or two to read a comic book, and in many, very little happens. Archie Goodwin used to call “decompressed” books “thin reads” — an apt term. It’s a lot harder to create and tell a real story every issue. I think “decompression” is just a writer’s cheat. Similar to an artist doing no backgrounds, lots of pin-ups and cropped close-ups. Note from JayJay: Perhaps this is a good point to mention that next week we are planning to begin Jim’s How to Create Comics series! "When Toth began doing work for New York publishers again in the mid-60s, he only did so for Warren and Marvel. Neither cartoonist worked for the company again until Carmine Infantino overhauled the editorial operations in the late 1960s." Actually, Toth drew several jobs for DC throughout the early '60s, beginning in '61, including his Eclipso stories, his Rip Hunter stories, and his Flash/Atom story, along with various one-shots. Speaking of Jim's Turok #1 script, Son of Stone fans might not be aware that Eduardo Francisco has a Twitter account. His username is eDufRancisco. He doesn't have as many followers as Jim so his fans might benefit from a #followfriday. Man, did I pick the right time to decide to get back into writing comics. Talk about a Master Class! Thank you so much, Jim! It was during your EIC run at Marvel that I decided to become a comic book writer, and though I've had several comics published over the years, nothing could spark this old writer's enthusiasm like an example of how it's supposed to be done – you know, with characters and plots and emotion! Judd Winick briefly addressed that subject in Batman #640 ("Family Reunion Part 2: While The Cat's Away") back in 2005. This was immediately after Jason Todd came back as the Red Hood and he wanted answers on how this could be possible. According to that story, Superman is in denial that he truly died at the hands of Doomsday. If that's true, Clark probably refuses to believe his afterlife experience shared with Jonathan Kent happened in Adventures of Superman #500 ("Life and Death") too. Bosch, I thought the first sample page was Toth like the Johnny Thunder page, but I wasn't sure. Seemed like an excerpt from a longer Toth how-to manual. Reminded me of Wally Wood's "22 Panels." It's the last artist that really stumps me. No clue. Kintoun, thanks for the Elektra resurrection summary. After three decades, I still haven't read a Miller DAREDEVIL yet. (Sorry, Bosch!) Sounds to me like this resurrection is justified since it doesn't maintain the status quo. Restored life has a price, and Elektra is not together with Daredevil at the end. She is back, but her situation isn't. People talk about life-changing experiences long after they have them. Resurrection should be the ultimate life-changing experience. Does Superman ever even think about his "death" 19 years ago – which would have been a recent event since DC doesn't have a real time universe. Jim recently wrote that he plays Solar in his mind, "like a little kid playing super-heroes in the backyard." Getting into the character. Do Superman writers these days get into Superman and ask themselves, "What if I were him? What if I died and came back to life? How would that affect me now? The way I see the situation in this storyline?" If the writer can get into a character, the reader can too. Otherwise the characters are merely plot puppets and IP icons. Empty shells waiting for good writers like Jim to empathize with them and bring them to life. I'm happy to provide some extra details to the circumstances surrounding the return of Elektra. Frank Miller earlier established that the Hand was capable of resurrecting an assassin named Kirigi at the cost of sacrificing their own ninja. When Kirigi was killed once more so that he couldn't be revived, the Hand turned their attention to bringing Elektra back. Around this time, Black Widow also perished when poison contained in foot spikes caused her to dissolve. Her corpse was quickly restored to life by a Chaste ninja named Stone in Daredevil #189 ("Siege"). During that same issue, the white Chaste were targeted by the red Hand. Stick and another Chaste menber called Shaft saved the lives of Natasha, Matt, and Stone by using the flip side to giving life which is taking it. This suicide technique allowed them to wipe out dozens of the Chaste's enemies but Stick & Shaft couldn't be revived afterwards because there was nothing whatsoever left of their bodies. This also meant there was no one left to replace Stone and the Chaste would disappear one day. When Daredevil #190 ("Resurrection") was published, it began with a prologue in which Elketra attempts to scale a wall that cannot be scaled in the distant past. She fails. Her sensei remarks that "all your rage and willingfulness are as nothing against the hammering wind and the unforgiving wall." In the present day, the Hand is preparing to empty their souls, blood, lives, and flesh in a Church to allow Elektra to return and serve their cause. At one point in the ceremony, Daredevil briefly hears a heartbeat coming from Elektra's body. It suddenly stops. Matt still loves her and is willing to kill himself if it brings her back. It's just a matter of moving energy but Stone claims it will not work since Matt is not trained and does not know the way. Soon, Daredevil concedes he's right and apologizes to her that he can't do it. In the last few pages, an unexpected assist from the Kingpin's goons wipes out most of the Hand but a fire is now out of control. Stone is ready to end it by disposing of Elektra's dead body permanently. He lifts his word to strike when he's shocked to discover she's clean. In his futile attempt to revive Elektra, Matt purged her. In other words, she's no longer useful to the Hand. Stone is the last surviving member of the Chaste. He's wounded, growing old, and weary. Eventually, Matt & Natasha reenter the Church and see that Elektra's body is missing. Matt believes Stone took it and did what he had to do. Natasha points out we all do what we have to which leaves Matt a bit suspicious and they flee the burning building. An epilogue features Elektra climbing the wall that cannot be scaled once more. She claims "He must never know. He must seek his own destiny, live the life he knows — and perhaps, in time, forget her. She seeks a destiny of her own." She almost falls but manages to climb to the very top. Removing her parka at the peak, she smiles. Perceptive readers will notice she's dressed in white which gives the impression the Chaste will endure. Thanks for the response! I'll take a look at the script and see about picking up some of the new comics. Thanks for making the Turok script available! I've seen bits of this script at Dark Horse's site, but now I get to see the whole thing! I look forward to comparing it to the printed comic. Just browsing through it is a mind-expanding experience. The amount of detail, of *research* is staggering. The opening pages make me eager to learn about the art of copy placement. I recognize some of the artists in the samples of open panels, but not all of them. I'm no good at playing "Name That Genius." Answers, please? If you read the script before the printed comic, I'd be interested to hear how you think they compare. Or Adam, if you prefer… Jim just asked me to make the Turok #1 script available for download. I've added a Downloads section at the bottom of the Widget boxes on the right side of the blog. So you can download the script and read it. And anyone else that would like to as well! Enjoy! At the risk of hawking my own stuff, please have a look at the Dark Horse Comics I'm doing now — one cranky old man to another, I think you might enjoy some of them. Doctor Solar, Magnus Robot Fighter, Turok, Son of Stone and Mighty Samson. Wylodmaker, I don't think you're being fair adjusting the phrasing behind Scott Bryan's question and quoting only half of Jim Shooter's response. The issue raised yesterday was why Kitty was taken out of Secret Wars. Jim didn't recall artwork being changed due to her presence and then expressed a little surprise that she was absent. For some reason, Wylodmaker seems to interpret that as Jim claiming Kitty always remained part of Secret Wars. He said no such thing. Keep in mind that the article included in Marvel Age #12 mentions every character who had a role in the limited series. Even though she's shown on the cover, it's clear Sprite was already ommited from the story at that point. It's fun to speculate how Secret Wars would have been different if Kitty fought alongside the X-Men but I doubt she was going to humble Galactus or do anything pivotal like that. I can see the wisdom in leaving Sprite out of Secret Wars. Claremont was able to use this detail to his advantage in Uncanny X-Men with Kitty not being able to compete with a dead woman she never met. Rather than be so skeptical, why not take into account that hardly anyone has a 100% perfect memory? If a Marvel fan incorrectly said Constrictor appeared throughout Secret Wars, would you dismiss him as a liar from that moment on? Give me a break. By the way, I hope Marvel sent Jim some complimentary copies of his Secret Wars Omnibus volumes. Dan Slott told me via Twitter that he was given the standard number of free copies based on "Skeeter" being reprinted at the end of the first hardcover. It's quite generous to send several $99.99 US collected editions to a writer for contributing a single She-Hulk tie-in comic. Jim, thank you so much for sharing so much on this blog. I started collecting Marvel when you were at the helm as EiC, and I always thought you did a great job. The sense that the whole Marvel Universe was connected was very palpable then, and the focus was on telling good stories with interesting characters, and striking the right balance of plausibility and realism within a fantasy environment. I haven't collected new comics in about a decade, because every time I pick up a new comic and read it, because they seem to have run out of good stories to tell and instead just want to mess with the characters and have them brood, taking 6 issues to tell what could be condensed into one issue back in the day. I don't even like the art or the electronic coloring. Oh man, now I sound like a cranky old man. Oh well, there's still plenty of old stuff from the 60s through the 80s for me to catch up on. Anyway, I wanted to chime in with some support not just because I just discovered this blog and have really enjoyed it, but also to counter Wylodmayer's comment above, which I thought was just uncalled-for. We can't expect the creators of artistic works to remember every detail of every work they created, especially in a field like mainstream comics, where Jim had to oversee dozens of comics every month. It's great to be able to read what stories we can about how these books were created, but human memory is fragile and we have to be content with leaving some things unknown. One, when Miller wanted to bring back Elektra. I originally said no, but he sold me on the story, which as I recall, involved somebody else dying and some kind of transfer of spirit thing that seemed to work in context. Forgive me if I don't remember the details, properly, but Frank's story was cool and justified her return, that much I remember. I think it actually even left some doubt as to whether or not it was her, or purely her occupying the body. Somebody who has read this more recently than 30 years ago, please throw me a rope, here. The other one was the return of Phoenix. Again, given her powers and the story/explanation offered, I caved in. Her name is Phoenix, after all. Let me amend one little thing. I believe Evanier's book reflects what I've written about Kirby and DC. I don't know if he ever discussed Toth's dealings with them. And yeah, I gather Toth tended to fall out with just about everybody who dealt with him. I'd like to echo other people's appreciation for your being here and agreeing to answer questions from fans. One question I was wondering about: during your time as EiC at Marvel my recollection is that it was very rare for characters to return from the dead, which I thought was keeping with the idea of the Marvel Universe trying to be realistic by superhero standards; it also created a sort of suspense that I no longer feel when a Marvel character dies, that the stakes really were high due to heroes fighting people who were often trying to kill them. So my question is, were returns from the dead something you actively discouraged, or just something that happened (or rather didn't happen) naturally due to the way comics tended to be written in the 1980s? You speculate that a political problem kept Kirby from returning to DC. Nothing in my experience there suggests that's true. The Toth situation was completely different. His dissatisfaction with DC was larger than his falling out with Julie, and he famously had "blow-ups" with other DC editors and brass. Until Carmine became publisher, I don't think he would have considered returning to work for anyone there, and I think he would not have been welcome. But, now I'm speculating. I didn't know Alex very well. A few conversations and one long letter from him, which I have around here somewhere, in which he condemns just about everyone with the notable exception of Louise Simonson. Sorry. I haven't read Secret Wars for a couple of decades. Now that you mention it, yes, it comes back to me — Colossus's romance, the guilt. I should read it again. I've written a lot of stories, and, honestly, at the moment I was answering the question about her being left out, I just plain spaced. Again, my apologies. First off, thanks for replying to my other comment–about whether Kirby sued Marvel, and Lee and Kirby's personal views of each other–on the main scroll. Second, let me address the Schiff/Kirby situation further, since you discuss it again in this thread. As you say, DC editors back then had their little fiefdoms. According to Gil Kane, cartoonists there worked exclusively for a single editor as a rule. The issue seems to be whether or not a burning of bridges with one editor meant one’s bridges were burned with the entire company. Two cartoonists had fallings-out with their editors during this period: Kirby with Schiff, which was related to Schiff's lawsuit against Kirby over the Sky Masters newspaper strip; and Alex Toth with Julius Schwartz, over personality conflicts. Kirby moved over to Marvel. Toth first worked on romance titles for another publisher, and then moved to California to work for animation studios and comics publishers out there. When Toth began doing work for New York publishers again in the mid-60s, he only did so for Warren and Marvel. Neither cartoonist worked for the company again until Carmine Infantino overhauled the editorial operations in the late 1960s. That was when Schiff left the company. Now you say Schwartz, Weisinger, and Kanigher didn't favor Kirby's style. I can see that. DC considered Dan Barry’s style the ideal at the time, and Kirby didn’t fit comfortably into that mold. Neither did Frank Frazetta, who tried and failed to get work at DC during this period. Toth, though, was compatible with it, and it’s been reported that he was DC’s top-paid cartoonist when the blow-up with Schwartz occurred. His status at DC then was analogous to John Byrne’s when you were running editorial operations at Marvel. I’m speculating, but I think Toth would have been snapped up elsewhere at the company unless the other editors were deferring to Schwartz. And regardless of whether Kirby’s style was liked by the other editors, they knew his work had a strong sales record historically and was selling well at the time. They had a lot of incentive to hire him away from Marvel, and given that they generally felt they were slumming anyway, it doesn’t make sense that they wouldn’t have pursued him unless there was another issue in play. The fact that there was an internal political problem with hiring Kirby would explain it. We also know that Infantino began pursuing Kirby the moment he was in a position to do so, and DC signed a contract with Kirby shortly thereafter. It’s [Working at Marvel in the ‘60s was] an act of cowardice. I should have told Stan to go to hell and found some other way to make a living, but I couldn’t do it. I had a family. I had an apartment. I just couldn’t give all that up. It is conjecture to say that Kirby was blackballed at DC during this period. Kirby, at least, never discussed his conflicts with Schiff publicly. In fact, he seemed to have put it out of mind completely when asked about why he left DC for Marvel in the late ‘50s. But it is reasonably informed conjecture. Several who were there at the time–including Joe Simon, Gil Kane, and Mike Sekowsky–have said the Schiff conflict was why he left. And that, along with a somewhat analogous situation with Alex Toth, would explain why he didn’t go back to DC until Infantino took over and Schiff departed. I haven’t read Mark Evanier’s Kirby: King of Comics biography, but it’s my understanding that it reflects what I write here. As much as I've enjoyed reading these, I'm out. In regards to a question about Kitty not being in Secret Wars, Jim responded "Was she absent? If you say so. Dunno." Really, Jim? C'mon. Colossus' incipient romance with Zsaji and his guilt over it (because Kitty was back at home waiting for him) was, given Zsaji's eventual role in the resolution of the book, one of the major B-plots of the series. Either (a) you do recall that she wasn't in the series and you're just being flip with an honest question from a fan, or (b) you don't remember one of the tent-pole subplots of one of Marvel's most significant projects – one you wrote – and yet still want us to take seriously your recollections of all sorts of details about your career in comics. Sorry, Jim, but I'm out. It's been real, but I'm done. Thank you, I'm really enjoying helping Jim with this. And he has suggested I write a guest post this week! I hope everyone will like it. More heaps of praise for blogging your experiences for us. Absolutely riveting stuff for anyone that grew up on the best comics that ever were (meaning just about anything you ever touched). I'm sure I'm not the only one that's thrilled you're still in the business. Keep up the great work and please keep the blogs coming! Disney-owned "Marvel Comics" has turned into pre-Crisis DC: irrelevant, boring and plodding as a general rule, not to mention the debasement of so many classic characters -the latest being Doctor Strange of all people. Warner-owned DC is just sliding backwards through time- currently in the late 1990s, but it won't be too long before one of their leading heroes "dies" again. I just keep getting more and more reasons to come back to this blog. Jim – you're an inspiration! Thank you for all you've done, and for everything you're still doing! I was browsing through Mike Zeck's cover pencils for Secret Wars #1 found at the back of the Omnibus and discovered there were 3 instances where Kitty was going to appear in "The War Begins". The text alongside this bonus material just says "Note the numerous changes between the original and the final printed book." First, Kitty was drawn with Lockheed on her arm in between Captain America and Cyclops on page 2. She was replaced with Wasp and Lockheed was moved to page 3 where he's flying above Hawkeye. Next, there was a supposed to be a small panel on page 6 featuring Kitty, Captain America, and Cyclops reacting to a galaxy being "swept away like dust before some unseen, giant hand." This scene is gone in the published comic. Lastly, Kitty's face was shown prominently wioth Lockheed on panel 5 from page 22 where Doctor Doom flies away. This precise moment was left out in the final draft. I think that's everything but feel free to point out any cameo I might have missed. All good stuff, Jim — thanks! And I add my voice to the crowd, about looking forward to your "How to Create Comics" series. Scott Bryan is referring to the cover for Marvel Age #12 which features Shadowcat. In fact, there are 3 pages inside the Secret Wars Omnibus dedicated to this artwork. Above the cover pencils for issue 1, someone wrote "Note the inclusion of Kitty Pryde, who ultimately didn't appear in the series, as well as Mr. Fantastic and Thor, who were likely removed to fit the logo on the final printed cover. Nightcrawler was shifted to the right to fit the cover copy." Kitty was positioned in between Cyclops' head and Nightcrawler's feet. Fraytag's pyramid should be a guide for each issue of a comic, not just the whole arc. No question, I just wanted to get a "thank you" back to Jim. Back in the early late 70s or early 80s Jim made a convention appearance here in Indianapolis and he sat down with me and made a small list of the essential things I needed to know to do good comics. I kept that little scrap of note paper for a long time (sadly I've lost it by now, but then I never made it into the comics field for a variety of reasons). I have had a 30+ year career in illustration and what he told me in that conversation helped in many areas. I look forward to his Create Comics series. I've always thought that Jim was very kind to give me that time and I'm sure he did it many many times for a lot of other people. Thanks Jim. Mr. Shooter, did you ever meet Alex Toth? What did you think of his work? Jim and Jay Jay, thanks for taking the time to answer our questions and forwarding the answers here. 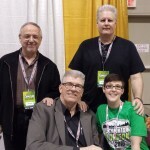 It's been great reading Jim's blog and learning more about him and the history of comics. I find the writing for the trade mentality rather tiresome to be honest. It isn't just that but I feel like stories are being recycled more often or worse yet for shock value. One could say that reading comics as long as I that of course I would see things repeat but a creative idea can only be done once. There are PLENTY of talented writers out there but when I read I feel like it's near mandated for the last decade to lock readers in 6 months at a time regardless of success. I'm really looking forward to Mr. Shooter's How to Create Comics series, JayJay, I'm always interested in knowing more about the creation of comics, one can never learn enough. Once again, thank you for answering our questions (and thanks to JayJay for forwarding them!). I had no idea you had four years of art training. All this time I had assumed you were self-taught. Oops. You certainly had a lot of opportunities to apply what you learned, both at the time and for decades afterward. Did you ever have any formal training in writing: e.g., creative writing classes? That story about Matter-Eater Lad's family problem (ACTION #381) impressed me because it made the Legion's future world feel real. Not everyone in the 30th century was living like the Jetsons. Matter-Eater Lad and Peter Parker could have understood each other's money problems. A touch of Marvel in the back of a DC. I don't know how anyone can doubt your description of Mort's treatment. Other creators have similar testimonies. I think that full-page panel of the Angel flying was a Kirby layout with Werner Roth pencils from X-MEN #17. I read a reprint of that issue back in 1983 and the image has stayed with me for over thirty years. Single-page panels like that work when used sparingly. They are meaningless when they're the norm. I first read Ditko's SPIDER-MAN as a ten-year-old and wasn't bored by the conversations. Talking heads can keep readers spellbound. It's all in the words and presentation (Wally Wood's 22 panels that always work come to mind). Each of those early 60s Marvels was an intense read, whereas a "decompressed" comic is a fleeting experince, to put it nicely. "Thin reads," indeed. I'm thrilled to hear from JayJay that How to Create Comics is around the corner! In reference to why the Marvel books were selling, the popularity of Jack Kirby among creators, and why decompression has led to weak comic books — it's the storytelling! The Marvel books from the 60s through the early 90s emphasized storytelling, characterization and depth of emotion while using heroic action in service of those basic storytelling principles.